It is with great pleasure that we invite you to the III Annual Symposium of The Society of Spanish Researchers in the Federal Republic of Germany (CERFA – for its name in Spanish), which will be held at the Instituto Cervantes in Berlin, on the 7th of November 2015. 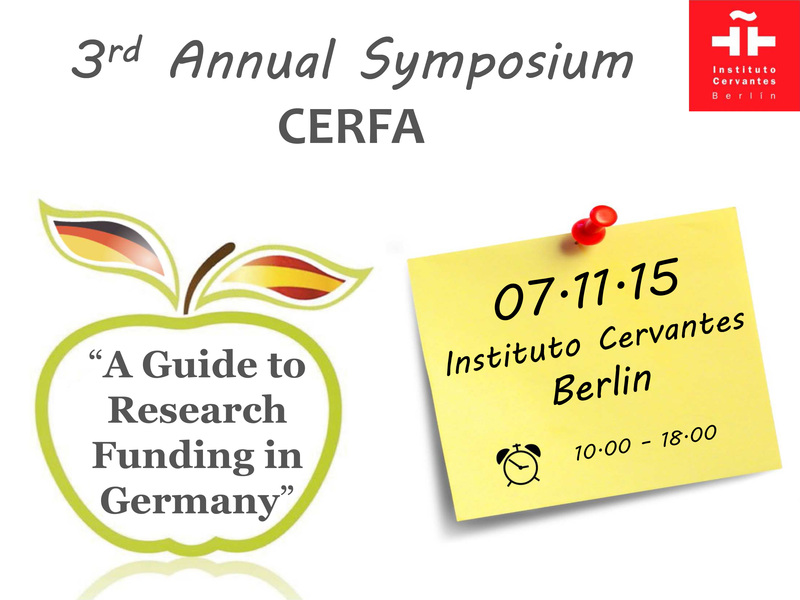 The title of our symposium is “A Guide to Research Funding in Germany”. The event will commence with a Welcoming lecture from 10.30 am, followed by the lectures of the invited speakers from the different Funding Institutions, and a final Round table about Fellowships and Grants. It will bring together leading scientists in this field and members of different R+D Funding and Research Institutions. It is a great opportunity to meet other researchers carrying out their work in Germany, discover new funding opportunities, and learn new advice to improve the application of grants and projects. Please, find additional information about the event, together with details about how to register and to arrive, in this webpage. We look forward to seeing you in Berlin in November.